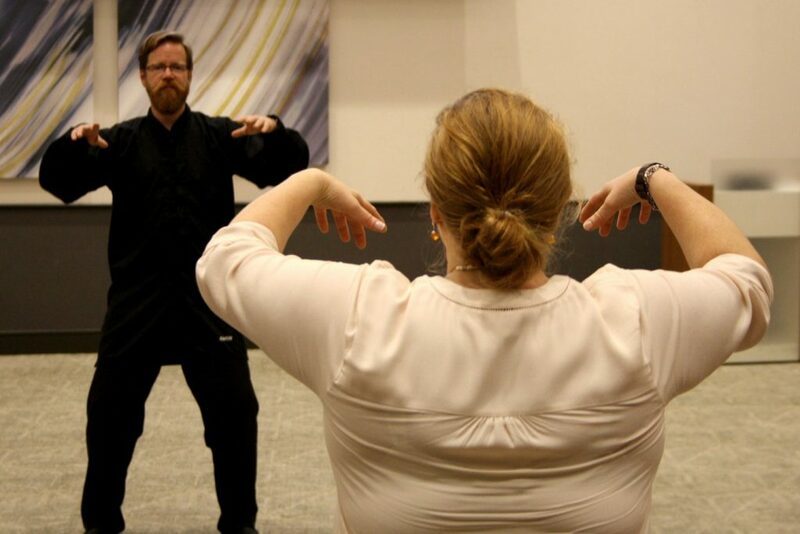 This week’s photo of the week is Dr Samuel Nyman‘s entry of a Tai Chi class in action. This weekly series features photo entries from our annual Research Photography Competition taken by BU academics, students and professional staff, which gives a glimpse into some of the fantastic research undertaken across the BU community. The TACIT Trial is all about people. 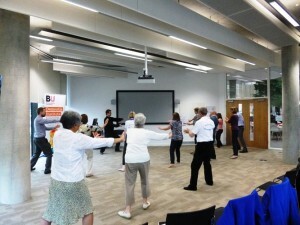 The study is undertaken by a team of researchers led by Dr Samuel Nyman at BU who are looking into the benefits of Tai Chi for people with dementia. Qualified Tai Chi instructors, such as senior instructor Robert Joyce from Elemental Tai Chi (photographed), lead the classes. The classes are attended by people with dementia and their informal carers. The classes involve slow, gentle, fluid body movements and slow breathing that leave you feeling relaxed and yet you have exercised your core muscles. In this randomised controlled trial, we are following up for six months people who have taken part in the classes and practiced at home and are comparing them to others who have not done Tai Chi. 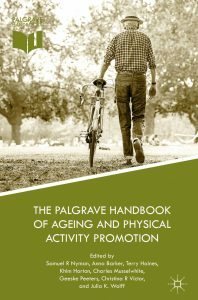 This will provide initial evidence for the first time in the UK as to the benefits of Tai Chi for the health and well-being of people with dementia and their informal carers. This photo is taken from a workshop for Solent NHS led the the chief investigator Dr Samuel Nyman and Robert Joyce. Dr Samuel Nyman is a Principal Academic at Bournemouth University. For more information about this research, please contact Samuel here. 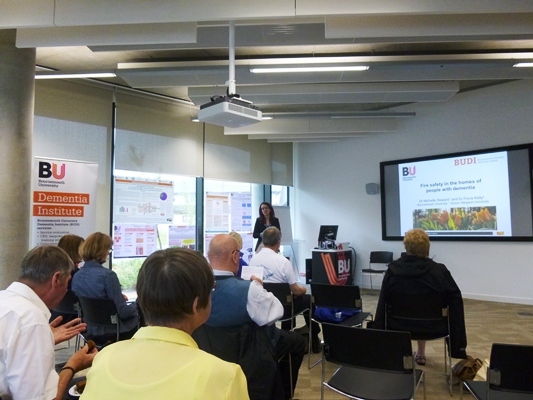 On Wednesday 29th June, BUDI hosted an event ‘(Re) consider Dementia’ as part of the annual BU Festival of Learning. It was a packed day and showcased a number of research projects as well as entertainment from the BUDI Orchestra. During the morning, Dr Samuel Nyman introduced the TACIT Trial. Funded by the National Institute for Health Research, this project will teach Tai Chi to people living with dementia in the Bournemouth and Southampton areas, with the aim to see whether it leads to improvements in postural balance, health and wellbeing for them and their carer. Some of the Tai Chi exercises were then taught to the participating audience by Robert Joyce of Elemental Tai Chi, who is part of the team working on this project. 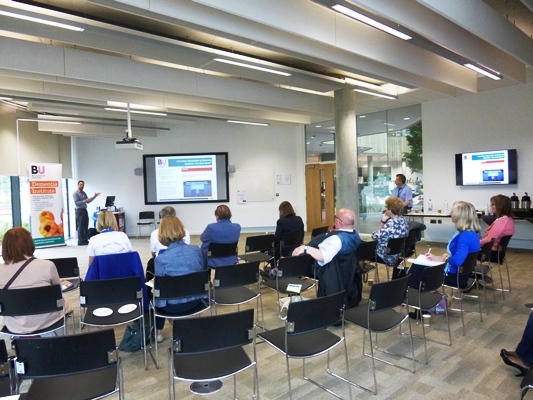 You can obtain further information by visiting http://blogs.bournemouth.ac.uk/dementia-institute/2016/02/18/4170/. Over the lunch hour, attendees were entertained by the BUDI Orchestra as they held their concert in the Student Hall. This performance was the first of three that will be held over the next 12 months following funding from the Arts Council won earlier this year by Andy Baker, the lead musician. 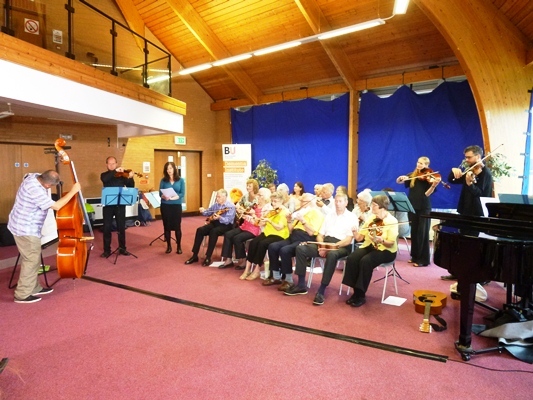 The orchestra is made up of those living with dementia, their carer partners, BU staff (in the picture you can see BU’s Sarah Cronin singing “Danny Boy”) along with 5 talented musicians. Everyone was joyous and in good spirits especially as the BBC were filming the orchestra for their Inside Out programme to be featured in September. Bournemouth Echo as well as BU’s PR team were also taking photos, video clips and quotes from both the orchestra and the audience. You may have seen the Echo’s article already. May we take this opportunity to ask that should you know of anyone living with dementia that would like to join the orchestra, or if you have any unwanted string or percussion instruments that you no longer have use for then please do contact budi@bournemouth.ac.uk as the orchestra will give them a good home. Finally, Mary Duah-Owusu White presented for the first time on her PhD “Improving care for people in acute hospital wards”. 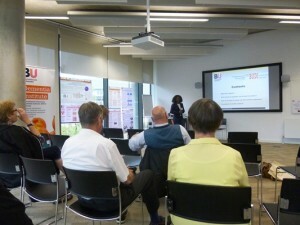 The audience listened with interest and look forward to hearing the outcomes at a future BUDI event.